My menu is a little late this week. I drove up to Savannah on Thursday to help my daughter move out of her dorm room and get it all cleaned, so I was out of town on Thursday and Friday. I am still amazed her freshman year of college is already over! My drive to Savannah was an easy one - the interstate cooperated and the weather did too - mostly. There were 2 quick storms I had to drive through in Georgia - at one point it was even hailing, but fortunately both were over quickly. Once in Savannah I headed straight for the dorm. Madison was waiting for me - she let me in the gate; I parked the truck, and we headed to dinner. It was her last day of freshman year and she ended it with straight A's! She had a very successful first year of college, and we are so proud of her! After enjoying a nice meal, we walked back to the dorm and assessed the situation. Clearly it was going to be a big job! There was still lots of stuff to organize into boxes, and lots of trash to remove. Both of her roommates left the day before, and Madison agreed to take care of all of the cleaning so they could get home. In addition to the cleaning (which was a big job all on its own), we had to move Madison's furniture into storage for next year. She is sharing a storage unit with a friend, and we picked up his stuff for storage too. We worked until midnight Thursday, and woke up at 6am on Friday to start moving the furniture out. We got to the storage place around 7:30 and no one was there! We had to wait until 9am for the attendant to get us into the unit, so we went to breakfast. After picking up and transporting Johan's stuff to storage, we got to work in the room. We just about used an entire bottle of bleach on that room, and we finished around 2pm - had the walk-thru with the RA - then went to the barn to say so long to the horses. After having a late lunch, we drove home and made it by 9pm. So happy to be home with my girl. She'll only be here for a few days, but I plan on making her favorite things while she is home, so my menu this week will be built around Madison's preferences. Monday - Meatball subs and french fries (use leftover meatballs and sauce). I use mozzarella cheese on the subs. For the sub rolls I use this bread, but you can purchase sub rolls at the bakery. 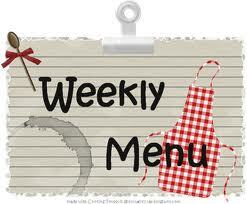 Back to normal next week with a full menu and shopping list. Have a great weekend! !